title text: I will never stop beating this trope to death. zach needs to do some fact-checking, there is not a single point in australia with the US directly on the other side of the earth: https://www.antipodesmap.com/. it all falls to the atlantic ocean. 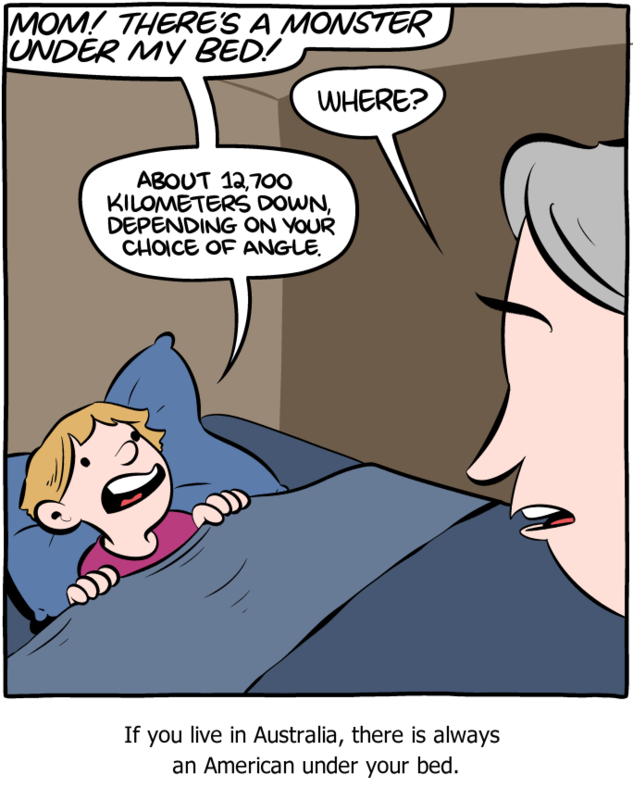 and i know the kid said "depending on your choice of angle", but by this logic my neighbour's house is also "under" my bed. Also in Australia we call our mums "Mum" not "Mom". Regardless of the two bugs, it's great to see Australia in a cartoon. A fun country, but not necessarily a funny one. gumby wrote: Also in Australia we call our mums "Mum" not "Mom". Regardless of the two bugs, it's great to see Australia in a cartoon. A fun country, but not necessarily a funny one. Re: Mum/Mom. Yeah, he probably wrangled with it but didn't want to spoil the punchline. No. Pretty sure Americans are pretty content considering other Americans monsters. Pretty sure Australia has enough monsters that we don't need to assume the people are, too. That said, I'm 90% sure that there's one species of Australian spider that has learned to kill people, infest their flesh, and then puppet them around like a spider-mech, so maybe the people are monsters too. Well for that, an Australian spider would obviously have to kill somebody, which they do not, so I doubt the surety of your claim.